On May 31, 1988, President Ronald Reagan stood before a packed audience at Moscow State University. He delivered a speech that would go down in history, as it was the first time an American president had given an address about human rights on Russian soil. The importance of this speech was largely overlooked at the time, yet the following year, in November 1989, the Berlin Wall fell and the Soviet Union began to disintegrate, leaving the United States the sole superpower on the world stage. 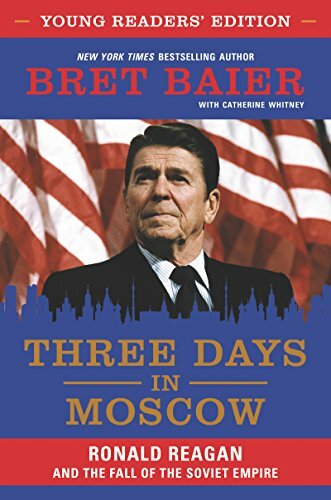 Adapted for a younger audience, and including an 8-page insert of historical photographs, Three Days in Moscow reveals the president’s critical and often misunderstood role in orchestrating a successful, peaceful ending to the Cold War. This page-turning, accessible account sheds light on America’s current place in the world while introducing young readers to one of America’s most remarkable leaders—and the unique qualities that allowed him to succeed with America’s most dangerous enemy, when his predecessors had fallen short.